Sample tweet: "found new iphone app that turns anything you take picture of into $40 million investment opportunity"
The editor of the popular blog Search Engine Land (and creator and former editor of Search Engine World), Danny Sullivan is one of the world's leading experts in Web search optimization and marketing. 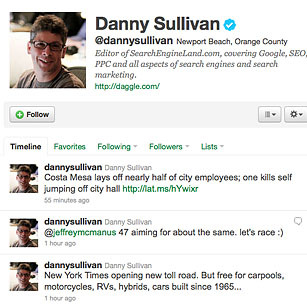 Those following his tweets are updated with the latest on companies like Yahoo! and Google, along with any and all things search.